Calvin (Ice Cube) inherited his family's barbershop and has been running it while always looking to make it doing something else. With tax bills due and not enough money coming in, Calvin decides to sell the shop. However he slowly starts to realize the importance of the shop to his Chicago neighborhood. Directed by Tim Story, "Barbershop" shows us a day in the life of the people and the neighborhood surrounding a local Chicago barbershop. Ice Cube plays Calvin, the owner of the shop in question, which has been in his family now for three generations. The shop is filled with a motley crew of characters, including Eddie, played by Cedric the Entertainer, who has worked there since the 60's and has a propensity for both humor and complaining; Terri, played by Eve, the only woman working in the shop; Jimmy James, played by Sean Patrick Thomas, who is college educated with higher aspirations, Isaac played by Troy Garity, the token white guy at the shop who is very much into black culture; Dinka, played by Leonard Earl Howze, the big-boned, sweet African immigrant who has trouble understanding certain aspects of American culture; and Ricky, played by Michael Ealy, a former felon just trying to keep on the straight and narrow. It is Ricky who turns out to be a major part of the subplot as he becomes the prime suspect when an ATM machine is stolen across the street from the barbershop. Though the primary story is about Calvin and his decision on whether or not to sell the shop, each player is given their individual moment to shine. 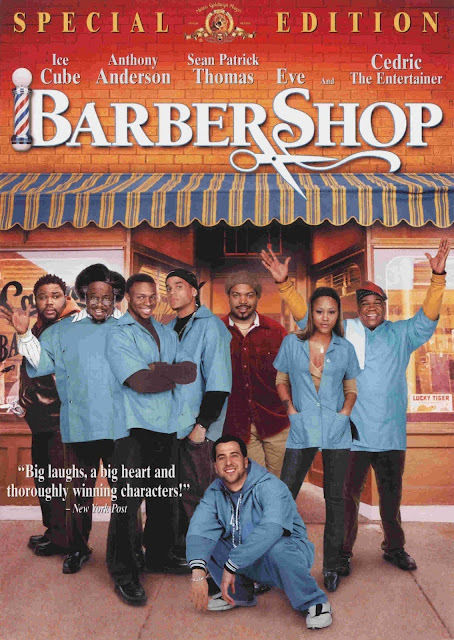 "Barbershop" is a movie we had never seen until now. It's actually quite funny! A lot of the humor comes from the banter that goes on in the barbershop between its customers and the employees. Cedric the Entertainer is the best part of the film. He gives off a wonderful vibe and is given some truly great, humorous dialogue. As the oldest member of the staff, he often talks about what's wrong with the younger generation today and offers up his often unsolicited opinions on historical figures, as well as the occasional anecdote. Though Ice Cube is the central figure and all of the goings on revolve around him, his part is much more dramatic than others as he wrestles with questions about money, community, family, and business. We really like Ice Cube, and he does get an occasional humorous moment in there every once in a while. Another good chunk of the comedy comes from Anthony Anderson and Lahmard Tate, who play J.D. and Billy, the two men who actually stole the ATM machine in question. They spend much of the movie doing a bumbling slapstick routine that is Laurel and Hardy-esque as they fumble around trying to figure out how to actually open the ATM they stole. They move it up and around rooms and stairs, in and out of alleys, and it's pretty damn funny to watch. The bottom line is, there are a lot of laughs to be had in "Barbershop." There is also an underlying message about the importance of having a real sense of community, which can be akin to a second family. What this film has to say about the importance, respect, and love for those around you is just as great if not more so than the jokes and quips. It ranges from dramatic to sincere and heartfelt as those from the shop come together and embrace one another's differences to find a way to make it work. It is this underlying message that makes "Barbershop" so successful, and in the end, it's an entertaining movie above all else. Though it is certainly not perfect, it sure is fun to watch. One year ago, we were watching: "Get Hard"